Bank Swallows nest in colonies where they excavate burrows, primarily in stream banks, across much of North America, Europe and Asia. They are highly social and colonies can contain from 4 to 2,000 nests. In Tennessee they nest in bluffs and riverbanks near the Mississippi River, but starting in 1969 they also started using human-made "bluffs" in dredge spoil and quarries in West Tennessee. In North America Bank Swallows breed from western Alaska to the Atlantic coast, southward through the central United States to southern Texas. In winter most birds travel to South America, with some wintering in Mexico. Description: This is the smallest swallow in North America. The Bank Swallow is white below with a distinct dark brown band across the chest, and brown on the back and tail. The wings are long, thin and pointed. Northern Rough-winged Swallows have a brown throat, and lack a chest band. Juvenile Tree Swallows have a brownish back, but a faint band across chest that is thinner in the middle. Nesting and reproduction: Bank Swallows colonies are typically found in vertical or near vertical banks or bluffs in lowland areas dominated by rivers, streams, and lakes. In eastern North America, including Tennessee, many colonies are found in sand and gravel quarries. Colonies in Tennessee range from 4 to 600 burrows, with an average of 108 active nests. Clutch Size: 4 to 6 eggs, with 5 most common. Incubation: The male and female incubate the eggs for 14 to 16 days. Fledging: Both parents tend the young, which fledge when 18 to 24 days old. Nest: Males dig most of the nest-burrow and nest chamber; the female builds most of the nest. Burrows are about 25 inches long, and the nest is a flat platform of grass, leaves, or other plant material at the end of the burrow. Status in Tennessee: The Bank Swallow is a very localized, uncommon summer resident, found in the state from late April through mid-September. Colonies are primarily built in natural banks in West Tennessee, and artificial sites elsewhere in the state. 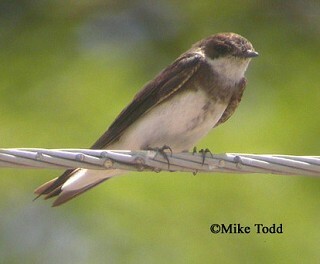 In Europe and Asia, the common name for the Bank Swallow is Sand Martin. In the late 1820s, John James Audubon was the first to describe Bank Swallows in Tennessee. He reported "thousands" of burrows in the Second Chickasaw Bluff, on the Mississippi River near Randolph, Tipton County. The first East Tennessee Bank Swallow nests were found in 1969 in dredge material near the Watauga River. The scientific name of the Bank Swallow is Riparia riparia, which double states "riverbank." Best places to see in Tennessee: Colonies are most likely to be found in bluffs and riverbanks near the Mississippi River. Due to the ephemeral nature of both their natural and human-made nesting sites, colonies are rarely found in the same location for more than a few seasons. Garrison, B.A. 1999. Bank Swallow (Riparia riparia), The Birds of North America No. 414 (A. Poole and F. Gill, eds.). The Academy of Natural Sciences, Philadelphia, PA, and The American Ornithologists' Union, Washington, D.C.